When it comes to pork Swanson Meats has you covered, from commodity to premium Duroc products we have it all. Pork has continued to grow in popularity as well as the demand for local all natural pork products. At Swanson’s we source our premium Duroc pork products from local MN family farms. Each day at Swanson’s we cut and process fresh pork to our customer’s exact specifications. Our commitment is to our customers and we try and out service our competition. Below is a sample list of the more popular pork items we cut and process weekly. 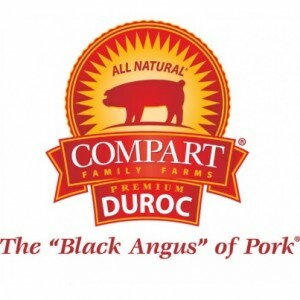 Compart Duroc promises an “All Natural,” mouthwatering, rich flavored pork, with superior tenderness and natural juiciness. Bright reddish pink in color, Compart Duroc contains a higher percentage of intramuscular fat (marbling) and a higher pH. These unique attributes translate into a more tender, juicy and flavorful dining experience. This selection of pork enables you to enjoy fresh pork in its natural flavor and juice, without injecting or pumping. Mrs. All Natural Pork is raised on local family farms. The MRS. Pork System is a network of 8 family farms producing high health animals for the newly constructed plant in Glencoe, MN. The Duroc sires used on the herds are of world class quality producing absolutely the highest quality meat product in regards to marbling and taste. We believe the freshness of the product also adds greatly to the taste. Preme Commodity Pork is unique as they are one of the few small, pork processors who has survived and prospered in the highly competitive, rapidly changing environment the industry has seen in the last three decades. Since 1969 they have been producing quality pork products to meet the needs of growing consumer demands.